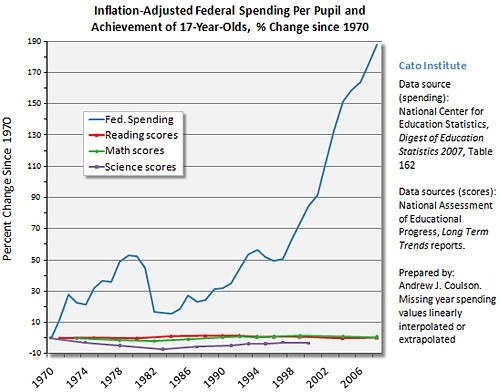 More of today's Republicans need to grow spines and renew the call to abolish the Department of Education. It’s unconstitutional, a waste of taxpayer dollars and has been detrimental to the quality of education in America. The Department of Education is just another avenue for the federal government to strengthen their control of the population. They establish policies that are no in sync with many Americans' family values, and then they proceed to shove them down our throats using our kids' education. That is why it is so important to provide our youth with strong conservative values and beliefs, and tools for them to use to educate themselves about other points of view. A new magazine called The Conservative Teen is a great resource for parents, grandparents and guardians. They cover social, moral, fiscal and political issues with an eye toward educating our next generation. You can check it out online, too, at http://ww.theconservativeteen.com/toc. these costs are outrageous-with little or no effect.i absolutely agree that the republicans need to grow a strong spine.so far i just don't see it.like i said before they're too soft on these exact issues. But think of all the test scores that didn't go down because of all that spending! I'm kidding. I am riffing off the argument that the stimulus "saved" jobs. ". . . by a just repartition among the states, and a CORRESPONDING AMENDMENT of the constitution, be applied, in time of peace, to rivers, canals, roads, arts, manufactures, education, and other great objects within each state." ". . . application to the great purposes of public education, roads, rivers, canals, and such other objects of public improvement as it may be thought proper, to ADD TO THE CONSTITUTIONAL ENUMERATION OF FEDERAL POWERS . . . I supposed AN AMENDMENT TO THE CONSTITUTION, BY CONSENT OF THE STATES, NECESSARY, because the objects now recommended are NOT AMONG THOSE ENUMERATED IN THE CONSTITUTION, and to which it permits the public moneys to be applied." And I must note, due to the Ron Paul, tag, I am not a Ron Paul supporter. I do support Michele Bachmann only because choosing her would decimate the Democratic Party. We would silence any and all opportunity to hear in 2016, "As the Party for Social Justice and Civil Rights since our inception, and the party that gave America the first African-American President, we now are going to give you the first woman President of the United States." And that my friends would surely weaken the Democratic Party, and, put National Organization of Women on notice, that it is through the Tea Party that America achieves "change we can believe in," because it is entirely rooted in Individual Liberty and Our Written Constitution limiting government, if we remain vigilant and enforce it. It is the Conservative who stands for the minority, the smallest minority, the minority of 1, the Individual in Liberty.